November is a great time to pick up a book—or your e-book reader of choice—and head down to a quiet cafe for an afternoon of coffee and contemplation, or stroll about romantic alleyways as the autumn winds rustle the fallen leaves on the street. 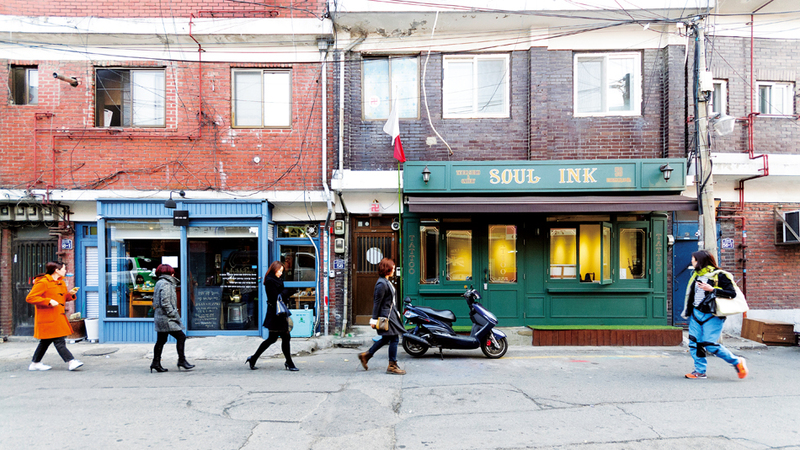 SEOUL Magazine introduces three quiet (relatively) neighborhoods that are especially enchanting in fall, when the leaves turn color and fall and temperatures get brisk. 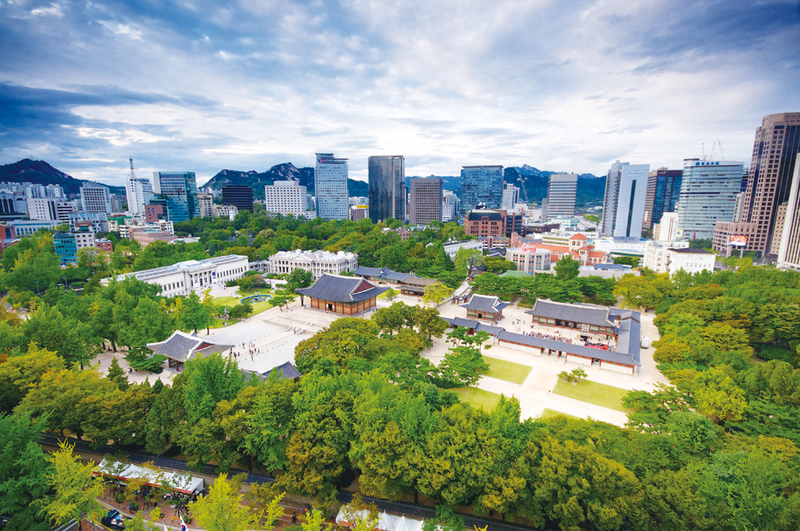 As Seoul’s historic “Legation Quarter,” Jeong-dong is best known for its historic Western-style architecture, including legations, schools and churches built by some of Seoul’s first Western residents in the early 20th century. 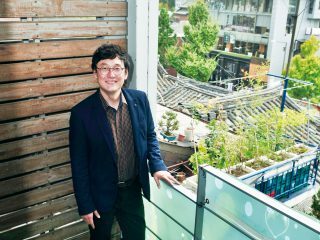 It’s a pleasant, shady neighborhood of quiet alleys, golden ginkgo trees and red brick buildings. 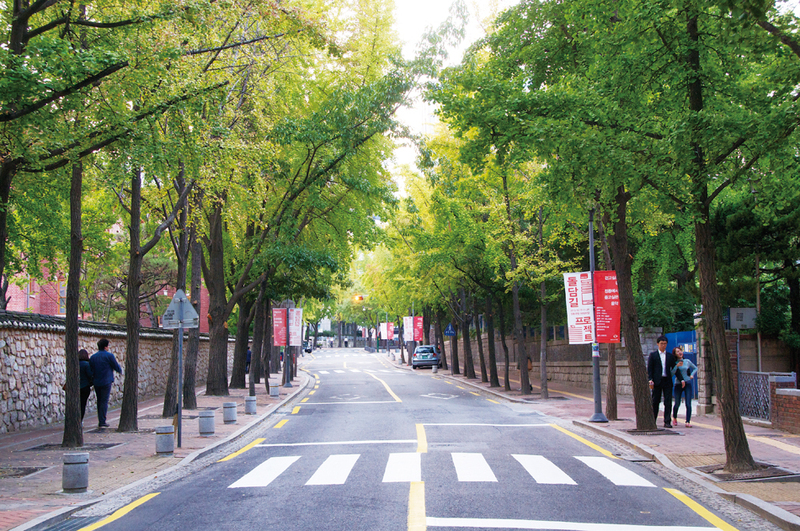 A particularly popular walking path is Deoksugung doldamgil, which follows the stone wall that marks the southern edge of Deoksugung Palace. Seoul’s primary royal residence in the dramatic days of the Daehan Empire (1897—1910), Deoksugung Palace forms the heart of Jeong-dong. It’s an eclectic mix of Korean and Western architecture, including a Russian-designed pavilion used by King Gojong as a coffee house. One of its historic Western-style buildings now serves as the National Museum of Modern and Contemporary Art, Deoksugung. Other historic buildings worth visiting include Chungdong First Methodist Church (1898), the old Supreme Court building (1928, now the Seoul Museum of Art), the east hall of Pai Chai Hakdang (1916), Ewha Hak Dang’s Simpson Memorial Hall (1915), Jungmyeongjeon Hall (1901), Salvation Army Central Hall (1928), the tower of the old Russian Legation (1885) and Seoul Anglican Cathedral (1926). The last is one of Seoul’s most beautiful buildings, harmonizing Romanesque and traditional Korean elements. Many of the buildings are now museums with interesting displays about the district’s history. Another highlight is Chongdong Theater (www.chongdong.com), one of the best places to see Korean traditional performing arts. The best views of the area are had from the newly opened Jeong-dong Observatory on the 13th floor of Seoul City Hall’s Seosomun Annex. There’s a coffee shop up there, too. Namdo Sikdang (T. 02-734-0719), hidden in the alley just in front of Jungmyeongjeon Hall, has been serving a mean chueotang (mudfish soup) for decades. Deoksujeong (T. 02-755-0180) does lovely Korean stews. Jeongdong-gil (T. 02-318-3556) serves some wonderful jeyuk bokkeum (spicy pork). Another pleasant place to eat—despite the name—is Café Birds N Bugs (T. 02-777-8988), where you can score good sandwiches and desserts that can be washed down with a variety of handmade teas. Nestled in the valley between the mountains of Inwangsan and Bugaksan, the tranquil neighborhood of Buam-dong has all the rustic charm of a provincial mountain town, but in the heart of Seoul. In the alleys and along the hillsides are museums and galleries, some inspired works of architecture and plenty of exceptionally pleasant cafes. There’s are some great vistas to be enjoyed, too. 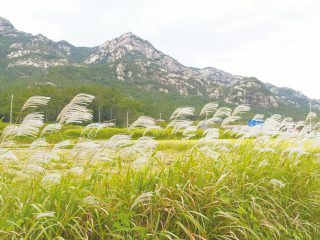 Most explorations of Buam-dong begin with Yun Dong-ju Hill, a lovely hillside park named for the 20th-century poet. 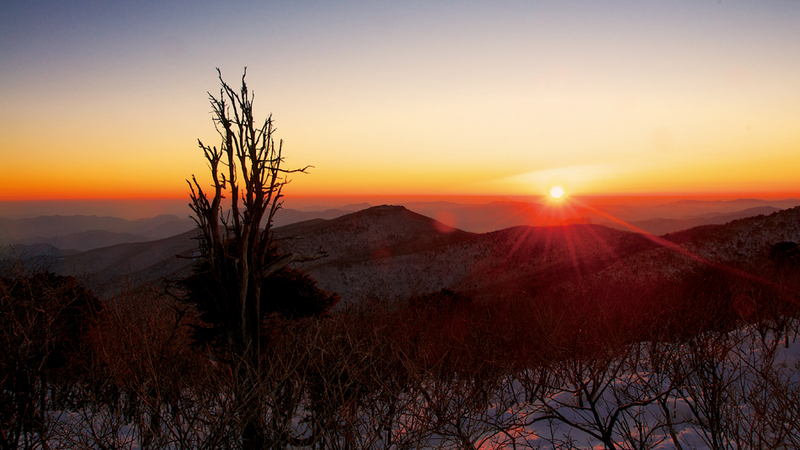 From the park, you can enjoy gorgeous views of downtown Seoul to the south and Bukhansan National Park to the south. Parts of Seoul’s old city wall runs through the park as well, and nearby is Changuimun Gate, one of the historic wall’s smaller portals. The highlight of the park is the Yun Dong-ju Literature Hall, a museum with displays of the poet’s writings and personal items. 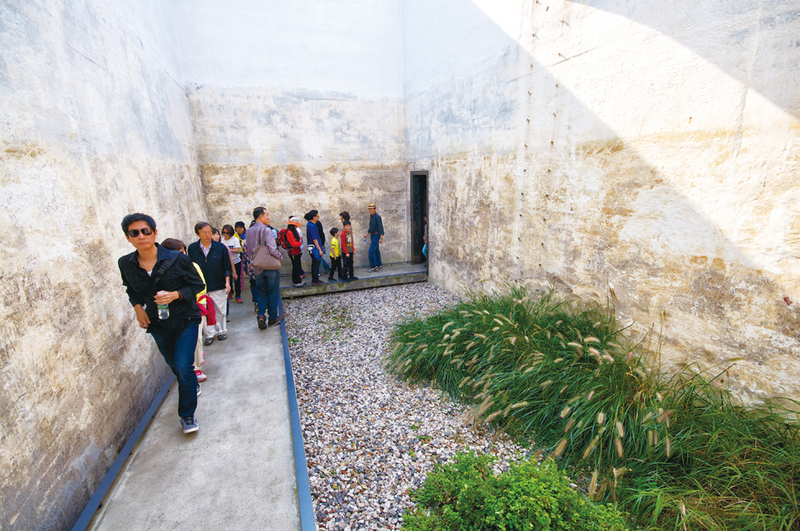 Architecturally sublime, the facility is a former pressurization station; one of the old water tanks has been turned into an open garden and the other into a video hall. Art and architecture come together again at the Whanki Museum, which houses the work of famed painter Kim Whanki (1913–1974). A pioneer of Korean abstract art, he was one of the few Korean artists of the 1950s and 60s who gained recognition overseas. Designed by architect Woo Kyu-seung, the gallery space itself is a masterpiece, making wonderful use of natural light and the space’s hillside location. Beautiful gardens are on the ground level and the roof as well. 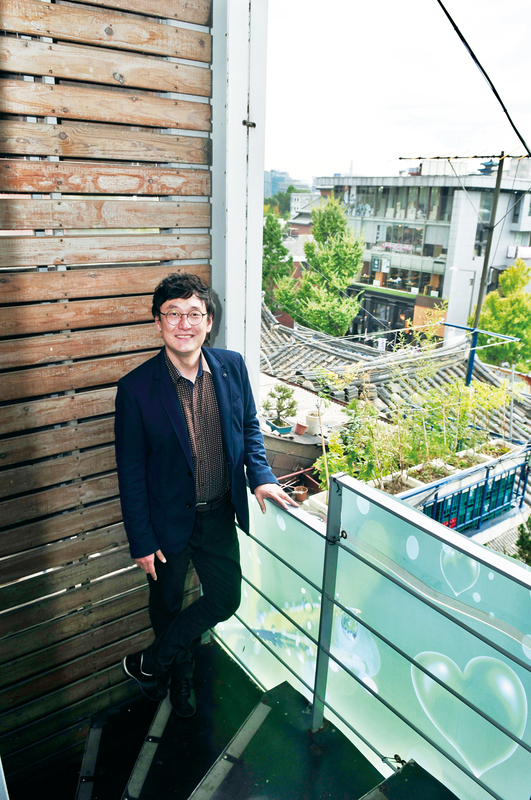 On the Inwangsan side of Buam-dong is Seoul Museum, a unique art space built into a steep hillside. While the art is certainly worth checking out, the real highlight is Seokpajeong, a late Joseon Dynasty villa once owned by the powerful 19th-century prince regent of Korea, Heungseon Daewongun. Now part of the Seoul Museum complex, the villa offers superb views of the surrounding mountains and forests. 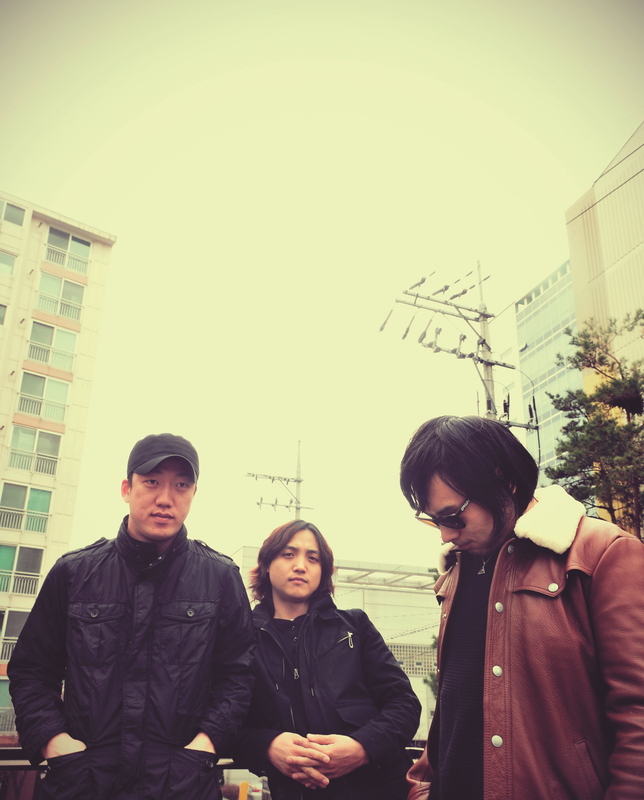 One of this writer’s favorite restaurants is Jaha Sonmandu (T. 02 379-2648) near Changuimun Gate. Not only does it have some of Korea’s finest dumplings, but also great views of the neighborhood. If you’re looking for upscale Korean eats, look no further than Seokparang (T. 02-395-2500), just down the road from Seoul Museum. 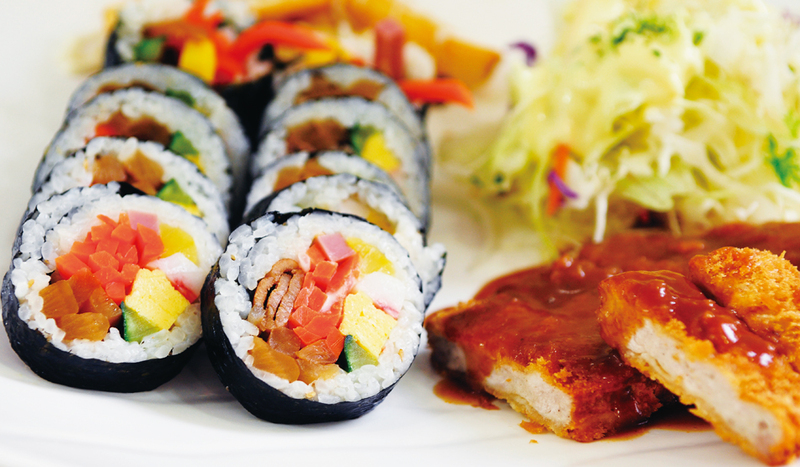 Specializing in Korean banquet cuisine, the restaurant uses only the finest ingredients and tableware. Even the buildings are historic, too. You’ll be tripping over cafés, too. A SEOUL Magazine favorite is Club Espresso (T. 02-764-8719), which offers a wide range of quality coffees (beans roasted on site) at refreshingly affordable prices. Not far from the Whanki Museum is the Ra Café Gallery (T. 02-379-1975), which as the name suggests is both a cafe and art gallery. A four-story complex built into the hillside, it also serves as a stairway linking the middle and upper parts of the neighborhood. GO>From Gwanghwamun Station 광화문역 (Line 5), Exit 5, follow the road that hugs the west side of Gyeongbokgung Palace and, beyond that, Mt. Gugaksan until you reach Yun Dong-ju Hill and Changuimun Gate. Garosu-gil is translated as “road lined by trees,” and sure enough, it is just that—a road lined by, in this case, golden ginkgo trees. Often called “Paris in Seoul,” this is perhaps a bit of an exaggeration, but to be sure, this neighborhood of cafes, eateries and boutiques has a bit of an Old World charm—check the cobblestone—that sets it apart from the rest of the trendy Gangnam district. Once home to art studios and galleries, the creatives have largely moved elsewhere, but if art is what you seek, stop by Gallery Yeh, a uniquely designed structure with an outer shell that serves as an experimental art space. In addition to work by international artists, the space also displays work by up-and-coming Korean artists. 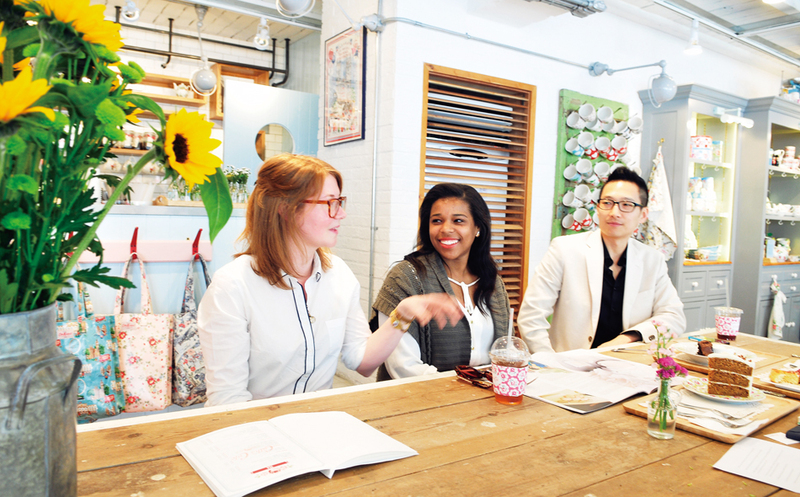 Many female readers—or male readers who love handbags—will no doubt adore the Simone Handbag Museum, opened last year by Korean handbag maker Kenny Park. The museum’s truly fascinating collection even includes a few handbags dating back to the 16th century. Once upon a time, Garosu-gil was lined with small boutiques that offered shoppers some truly original fashions and designs. You’ll still find a few such places, but brand names—both domestic and overseas—have made serious incursions. Garosu-gil is literally lined by cafés, winebars and eateries. You’re best off just exploring and finding something you like, but be warned, this place tends to fill up on the weekends. 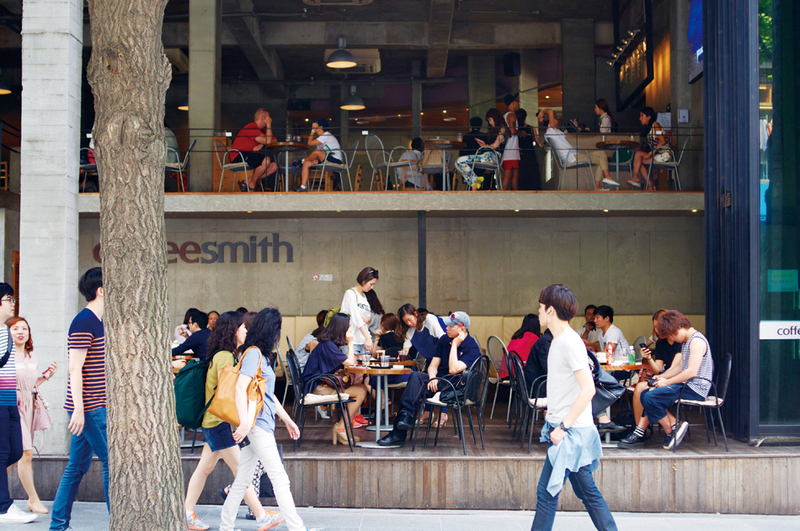 If you’re a coffee drinker—or people watcher—check out the landmark Coffee Smith (T. 02-3445-3372), a massive space with one wall removed so patrons can watch Garosu-gil’s movements over their hot beverages of choice. For something a bit different, try the basement wine bar Hello (T. 02-541-4427), a surreal space complete with bed seats (they’ve got couches, too) and a running stream and pond. Then there is the intriguingly named Mug for Rabbit, Cork for Turtle (T. 02-3443-7488), with a first-floor café and a second-floor wine bar. In addition to the cupcakes, they do, ahem, unique lattes, including a wasabi latte you’ll either love or hate. GO>Sinsa Station (Line 3), Exit 8.